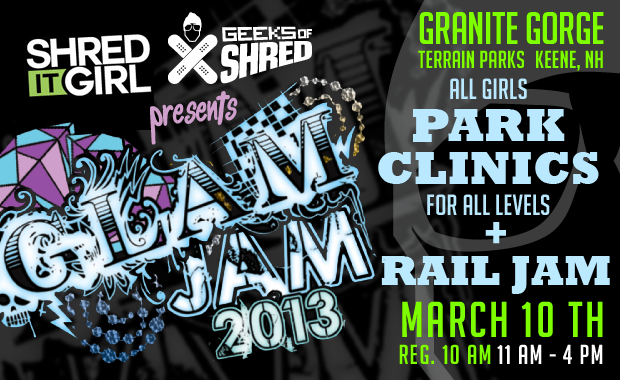 Shred it Girl’s Glam Jam Clinic and Rail Jam at the Gorge | Geeks of Shred! How many times have you rolled by the terrain park and been tempted to try but not sure where to start? Or discover you are one of 3 girls in a sea of dudes riding through and not giving you the time/space to work through a new trick? It can feel like an intimidating place beyond those orange fences. Shred it Girl in collaboration with Geeks of Shred invite you to come learn to ride park or grow your bag of tricks with our All-Girls Park Day. Glam Jam is a unique event for all ability levels. “Intro to Park” and “Intermediate Park” clinics will go down through out the day with all the tools you need to succeed . Whether its your first box ever or getting your 180 on the Geeks will be there to help you through it. Fun doesn’t end there, show off what you just learned in a fun and judgment free rail jam and win big. Forget your tunes because DJ JSTJR will hook up the beats. www.facebook.com/Jstjr . Come join us at Granite Gorge in Keene NH March 10th // Registration at 10:00 A.M. // Clinics and Rail Jam 11:00 A.M. to 4:00 P.M.